One of Dorchester’s long-struggling public schools is showing some signs of progress based on the results of statewide standardized test scores released last week. The Paul A. Dever Elementary School on Columbia Point, classified as a Level 5 ‘turnaround” school in 2014, posted exam results that indicate significant improvement in mathematics. Blueprint’s three-year contract ended last spring and the Boston Public Schools is again overseeing the school as part of their system. However, BPS retained the principal hired by Blueprint— Todd Fishburn — and much of the staff. Matthew Spengler, Blueprint’s founder and executive director, said that the MCAS testing affirms that the reforms made during its time in charge have been working. “We’re so excited that the [MCAS scores] really showed the results of so much work. 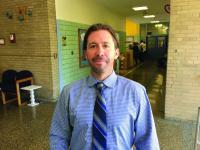 For us, it is about changing the mindset about what’s possible at a level 5 school,” said Spengler. Students across the state take the standardized test, commonly referred to as the MCAS, each year. Last year’s exam was reconfigured to better assess 21st century learning. Many school officials and educators believe that the new test is more difficult, making it a challenge to measure growth based solely on the standardized test scores. Still, all agree that the most recent test results showed growth for students at the Dever. “Now we have students who are outperforming not just at level 4 and 5, but across Massachusetts,” said Spengler, who credits Fishburn, a principal with experience in leading turnaround schools, with the breakthrough. Blueprint served as a partner to English High School and had a three-year contract, which expired in September 2016, to provide math tutoring and professional development. The organization was also running the Elihu Greenwood Leadership Academy, which closed in 2015. “When we were thinking about doing the receivership work [at the Dever], we knew it was going to be by far the most challenging work we had undertaken,” Spengler said. “It was designated chronically underperforming. It was a new territory, so working with the state and city we hired 70 new staff and had to redo the entire fiscal plan,” Spengler said. “One of the challenges was finding consistent strong leadership and that really affected lot of what we could do,” he said. During its time at the Dever, Blueprint engaged six full-time AmeriCorps “Math Fellows” to tutor 4th and 5th grade students in math. Students were given the opportunity for tutoring every school day, according to Blueprint. “We are always interested in helping to build quality schools for kids but we were able to complete out initial agreement and believe that the school is greatly improved after three years,” Spengler said. BPS said last week that test results also showed that the proportion of Boston 10th-graders scoring proficient or advanced in math climbed to 67 percent, a one-point rise from last year and eight point rise since 2009. Dorchester’s Jeremiah E. Burke High School, which came out of turnaround status in 2014, showed significant improvements in the recent test results. The Burke’s 10th grade MCAS math score posted a 15.5 percent rise in student growth, according to BPS.